Click the Character button on the lower control panel. Move the character left/right, up/down, forwards/backwards, or rotate it using the controls in the Character Position field. The default unit movement = 1 unit or 1 degree. Combine the Shift key to increase the object movement speed 10x. Press the Reset button to restore the original position and orientation. 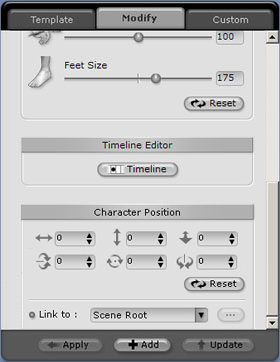 To move a character along a custom path, you can set position and orientation keys in Timeline Editor, See Animation Timeline Editing for details.